If you're based in the UK than your more likely to be taking your campervan closer to home research by ABTA has revealed 66% of the British population have already planned their summer vacations in the UK and where better than Newquay in Cornwall. Having travelled here every year for the last 10 years myself I have seen plenty of campervans because of the numerous amount of camp sites available and because campervans are often associated with laid back surfers around Fistral Beach which is the home of British surfing. If your not a surfer than there's still plenty to do in Newquay and nearby villages including twelve beaches to relax on, coastal walks and plenty of country pubs to enjoy a pint of local cider Rattler. It's easier than ever to get from the UK to France in your campervan. At just 35 minutes the quickest way to get to France is via the Eurotunnel from Folkstone to Calais where you'll find Normandy. With miles of sandy beaches and picture perfect villages to enjoy plus lots of historical sites including the world famous island commune - Le Mont St Michel there;s no reason why you can;t come back and explore again. If you want to venture a little further head to Brittany. Described as a French Cornwall, you’ll find dramatic coastlines, medieval towns and delicious seafood. France also have an alternative to campsites, you can park your campervan in stopovers and farms for free, known as Aires. 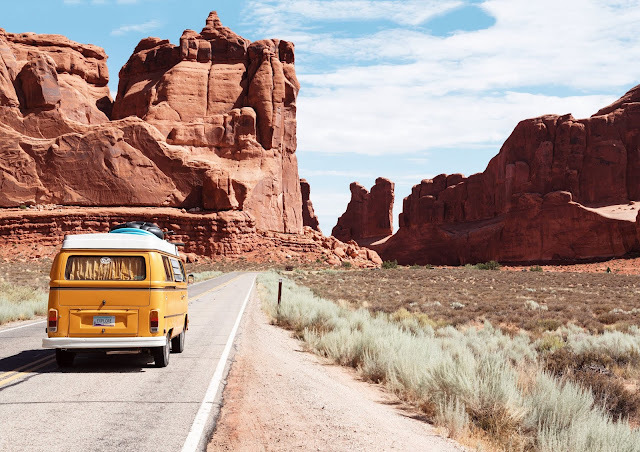 If you want to take your campervan on a road trip like no other than Route 66 is the one to take. Known as the ultimate American road trip and on many peoples bucket lists, you will drive from east to west spanning 2,400 miles, crossing eight states and three different time zones. Starting in Chicago and ending up in Los Angeles you will come across deserted and thriving towns, cool american diners, fascinating people and a whole lot of cool sights including the Shoe Tree, Santa Monica Pier, Grand Canyon, Cadillac Ranch and Blue Whale of Catoosa to just name a few. Geneva is unquestionably one of the most beautiful spots in all of Europe and although it may be small it's bursting with history and culture. Summer (June-September) is the most popular time to go on a road trip there and take in the views of Lake Geneva. With a backdrop of snow-covered Alps and the famous fountain Jet d’Eau, which rises to 140 meters above sea level on Lake Geneva is a must see. The town of Montreaux nearby offers a stunning view of the lake against the famed Chillon Castle. Other towns you may like to visit along the north of the lakeside are Morges, Lausanne and Vevey. The Netherlands is a very small country as far as distances go so you can easily drive from one end to the other within a few hours but it is also a very campervan friendly country. You’ll find specific parking for your campervan usually free of charge – including overnight stops in many towns, cities and villages. If you want to visit the Capital of the Netherlands - Amsterdam it is best to do it by bicycle. Park up to the nearest campsite and head into the city centre. From Amsterdam there are many beautiful cities you can visit including Kinderdijk, a UNESCO World Heritage site that is home to 19 beautiful working windmills, all built in 1740. If you're visiting around mid March to May head to Keukenhof located near the small town of Lisse to see the famous tulip fields. Or if you’re a cheese lover, there's plenty of places you can visit to experience cheese markets including Alkmaar, Edam and Gouda. If you want guaranteed sunshine pretty much all year round, friendly people, affordable food and drink plus plenty of campsites to park your camper than Portugal is the destination for you. Starting your holiday in Portugal's capital Lisbon, you can hop on an old-fashioned tram or a bike to explore the colourful tiled buildings, picturesque cobbled streets and amazing food culture. From Lisbon take a detour to Sintra, the country’s most mesmerising "fairytale" town, filled with pastel-colored villas and palaces and where you can take the windy roads through the Sintra mountains. You could also stop in Estoril and Cascais on the way back down. After take the Alentejo coast with places like Vila Nova de Milfontes and Porto Covowhich plus the most beautiful beaches, before heading to your final part of the campervan holiday to Portugal’s Algarve Region. I have been lucky to visit many times has more than 150 beaches along with dramatic cliffs and turquoise waters. Whilst in the Algarve don't forget to visit the famous Benagil Caves. Have you ever been on a campervan holiday?